These DVDs include the first season of the series HGTV series, “Flea Market Finds with the Kovels.” You’ll see rare marbles, antique quilts, European chests and boxes, Satsuma pottery, ceramic tobacco jars, Bakelite jewelry, vintage plastic dime store toys, Czech glass, Big Little Books, can labels and seed packets, old prints, and more! 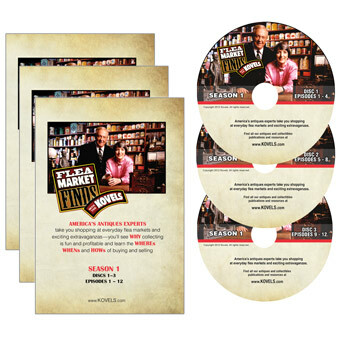 3 DVDs, 12 episodes in total — Get the complete Season 1 — ONLY $29.95! These DVDs include the first season of the series. You’ll see rare marbles, antique quilts, European chests and boxes, Satsuma pottery, ceramic tobacco jars, Bakelite jewelry, vintage plastic dime store toys, Czech glass, Big Little Books, can labels and seed packets, old prints, and more!